Then I started to wonder why that was. I'm not being critical of the people that commented; I find their opinions perfectly reasonable. I just began to wonder why my mindset was so very different. It is not that I don't have expectations for certain plants, and I do find myself disappointed if those expectations aren't met. I expect plants purchased specifically for flowers, like Hippeastrum, (Amaryllis) to bloom. I wait with eager anticipation for the cuttings I take to root, and the seeds I plant to sprout. I kind of wish that some of my younger Hoyas were mature enough to bloom, but the fact that aren't, and probably won't be for at least a couple of years, isn't driving me crazy. 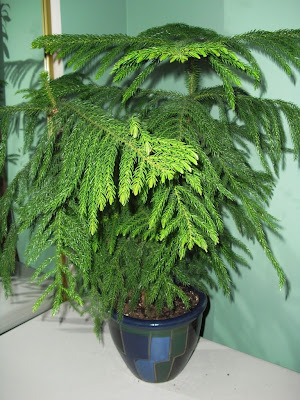 A previously posted picture of my Araucaria heterophylla (Norfolk Island Pine.) I've had this plant for a couple of years now, and while it does put out new growth--note leaf tips--it does so very slowly. I think one of the reasons, is that these days, I seldom purchase a plant that I am not satisfied with, as is, this very minute. I may see the potential in a plant, picturing it larger, more vigorous, in bloom, or what have you, but if I don't actually like what it looks like right now, I am likely to leave it on the shelf. If I already think a plant is attractive, I'm unlikely to be disappointed if it doesn't change much. Another reason is that I'm happy if the plant's growth pattern is in line with its natural behavior. If my Sans was supposed to produce multiple leaves in a short time, then yeah, a leaf a year would be maddening. 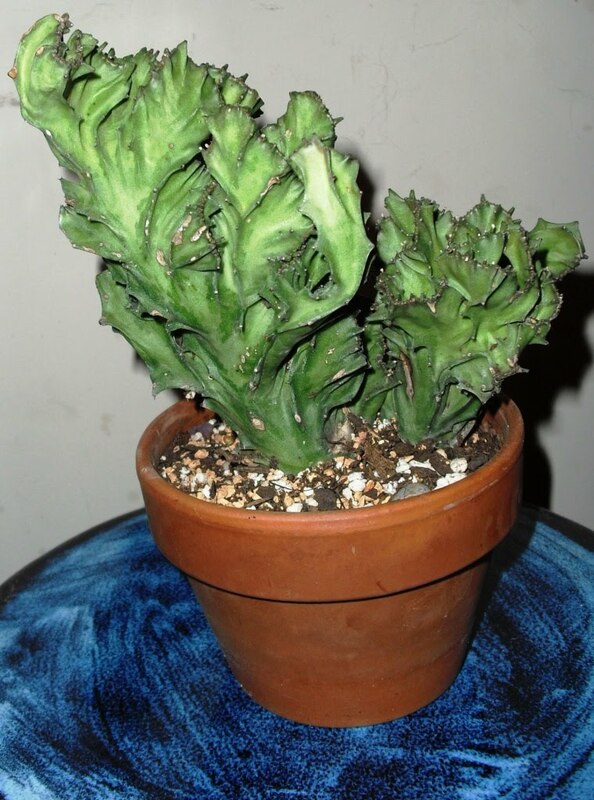 Euphorbia lactea cristata. Crested plants are often slow growers. I've had this plant for a few years. It could have gotten a bit bigger during that time, but I can't swear to it. Fortunately, I think it is cool-looking as is. A third reason is probably just that I have a lot of plants. I no longer know exactly how many I have, but 350 is a reasonable guess. When you have that many, several plants are usually doing something interesting at any given time, so it doesn't usually matter if any particular plant is just sitting there, doing nothing readily observable. There is a corollary to that third reason, as applies to Sansevieria: I have quite a few different types, that grow at different rates, so as a member of that group, the S. hallii has its own peculiar charms. Another previously posted picture of some of my other Sansevierias, from last fall. In front: Sansevieria kirkii var pulchra 'Coppertone'. The rest, clockwise from the left: S. masoniana, NoId S. trifasciata cultivar, S. kirkii var kirkii, and S. cylindrica. Ultimately, all growers of houseplants have differing expectations regarding our plants. As can be seen from many of my previous posts, I am thrilled with new growth from my plants, and am frustrated when they do poorly. But just as often, I am happy to just let them be whatever they are going to be, in the moment. My late mother would never have believed it, but my plants are going a long way towards teaching me patience and calm, qualities that she tried to instill in me, but that I have had great difficulty in achieving. Hi again! You know what, I don't know what the heck I was thinking when I posted about your plant that gets one leaf a year. I am a succulent grower for Gosh sakes!!!!!!! I am used to this fact. Some of my plants get one or no discernible growth in one year. So you know what I would like a plant like that.